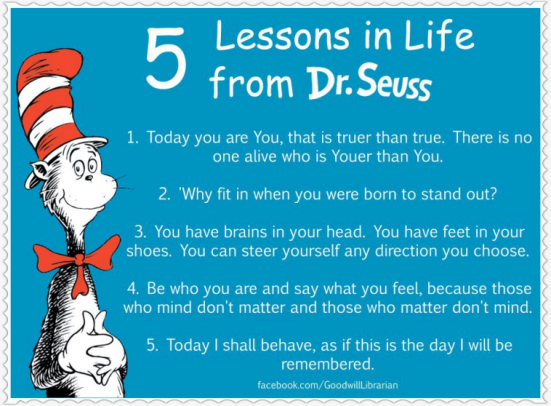 Dr. Seuss is such a great philosopher whose work does not lose anything over time. Perfect lessons for all of us to remember! Very clever Dr Seuss. He was. No wonder children love him so. I think of Kareem or Lew Alcondor in a picture from his high school in New York, Power Memorial. He is a foot and a half taller than anyone else. No hotel bed fits these giants. Mthe you have to sleep diagonally. We cannot be unique unless we are different. Difference is what catches our attention. Sameness just blends in and we do notice anything as it does not stand out.